This series is based on a hundred-page work of Jaroslav Sedláček, an amateur scientist from Hradec Králové, Czech Republic (†1993). He devoted his life to the study of the oldest written history of ancient Europe and provided a new and provocative explanation of many key events in the history of ancient Greece and Rome. We will set out on a journey to the past in the footsteps of heroes, which about thirty or thirty-five centuries ago were laying claim to immortality by slaughtering, ransacking, kidnapping beautiful women and by lying about their own bravery. Excavations in modern Hungary, Slovakia, South Moravia, Romania and Serbia reveal an interesting fact: iron-age hunters did not leave any traces in the lowlands. They always lived on hillocks and, in each period of history, at exactly the same elevation. The older excavations are higher than the newer ones, everywhere. It is as if the mammoth hunters had a giant spirit level. And, in fact, they did – they lived on the coastline of a gigantic freshwater sea – now known as the Pannon Sea. Among other things, they lived by fishing – even in places where there are no signs of fish today. This sea gradually dried up until, a few centuries before Christ, it disappeared for good. The Danube eroded its rocky banks and the effect was as if a gigantic bath plug had been pulled out. The entire Pannonian lowland dried up – in places changed almost to a desert. This is how the Hungarian flatland, known as the ‘puszta’, came into existence. All that remains of this gigantic okéan, as the Greeks called it, is today’s Lake Balaton. Historically, this sea covered half of Hungary and part of Romania. After a few centuries nobody knew where the sea that had previously been known as “the North Sea”, “the Atlantic Ocean” and as “Pontos Euxeinus” was. Historians’ conception started being based on the belief that the map of Europe has been the same as far back as mankind can remember. Let us start with a story, which is important only for its exact description of the world five centuries before Christ – when this sea was almost dried up. It concerns Herodotus’s description of the expedition of the Persian king Darius against the Scythians. As historians now tell us, when Darius wanted to wage war on the Scythians, he gathered an army, in Persia, of seven hundred thousand soldiers on horse and foot and set out for the Ukraine. He crossed the Bosporus on a floating bridge, built by the Greeks from Asia Minor, and turned north. He sent builders ahead by sea to build for him another floating bridge over the Danube. After he crossed it, he ordered his men to guard the bridge for sixty days, awaiting his return. He gave them a belt with sixty knots. Each day one knot was untied. Then he turned east with the army to the river Tanais, or what is now known as the river Don. After crossing the Don, into the land of the Sauromats, he travelled north to the land of Budas. There, he burned down their wooden town. From there he traveled east across the river Volga to the land of the Thyssagets and then to the Ural mountains. Throughout the entire journey, the Scythians avoided the fight. They demolished wells and drove away their cattle until they wore out the Persians. Darius turned back and traveled west to the areas inhabited by the Melanchlains, the Androfags and the Neurus peoples, through Scythia to the bridge over the Danube – he was late by only a few days and the bridge still stood. From there, he continued on to the Dardanelles. This is what history would have us believe. Yet it is difficult to imagine infantry marching through a barren land, constantly battling natives, fully occupied in constructing fortifications and razing towns, yet covering a distance of about two thousand miles in 68 days. Moreover, it is even more difficult to imagine how they negotiated rivers over a mile wide without a bridge, without boats, and without wood to build them. Furthermore, in the description, there are many rivers that we cannot find on the map, try as we might. Other rivers flow in the opposite direction. Arriving back at Turnu Severin his route is clear. Everything corresponds; distances, number of days’ marching, directions, mountains, lowlands, local names. It seems that Sedláček elaborated Darius´s itinerary precisely. Why? Mainly, because he wanted to identify exactly the places where individual peoples in the Balkans and Pannonia used to live. 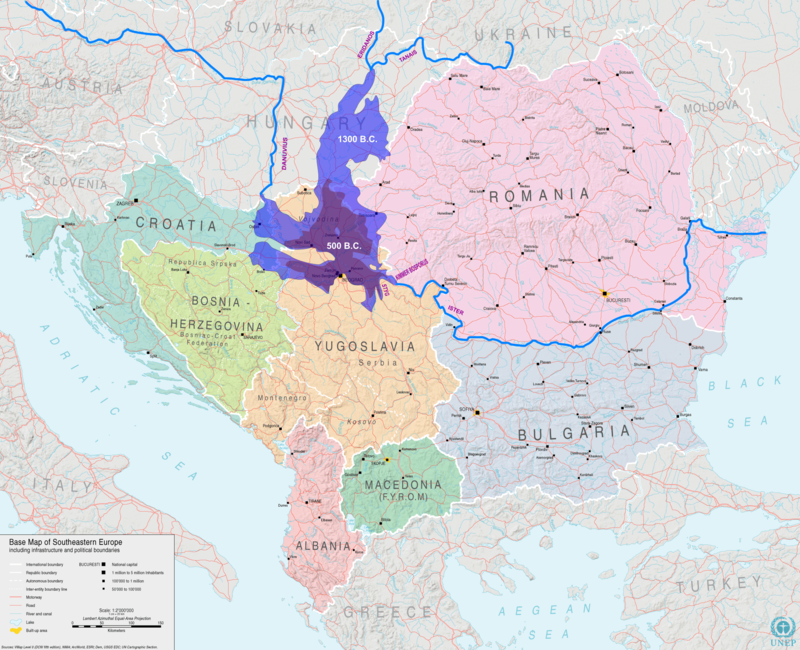 This information will be useful later on in the series, as it provides a basic orientation of the Balkan region, where we intend to show that these stories should be relocated. This also proves that the Scythians did not live in the Ukraine, as is generally accepted. Greeks and Persians regarded this territory as Asia. So Metternich´s famous bon mot that “Asia begins in Vienna on Landstrasse” is not so far from the truth. Actually the most interesting implication is that all of us who live on the left bank of the Danube live in Asia – without knowing it. What is the Golden Fleece? Hardly a remnant of a golden ram, as the myth says. There could be two explanations: sheepskin used to separate out gold particles from sand, etc. in a washing process or veins of natural gold. Both indicate that Colchis must have been rich in gold. Jason did not succeed in buying it or obtaining it for tasks he performed in the service of King Aietus – killing dragons, giants etc. He simply stole it and took the king’s daughter Medea with him as a lover or a hostage. Historical science places Colchis in the foothills of the Caucasus. But there are no deposits of gold in that area. On the other side of the Caucasus, however, in Romania, gold has been present until recent times. Sedláček explains the word ‘Colchis’ as ‘a mountainous land’ and ‘Colchidians’ as, simply, ‘highlanders’. This is feasible, as in Romania gold is mined in the mountains. After the theft and the kidnapping, the people of Colchis knew that the Greeks would be looking for the shortest route home. So they cut across the straits around the Peuke island (today’s mount Zagajičko Brdo – for simplicity I present only conclusions, not the whole process; we will use a map of the Carpathian Sea and raise the water level about 90 meters above the sea level, as it corresponds to the time of the story) and seized the estuary of the river Ister – Danube. Which made the return of the Greeks impossible. The Argonauts – with absolutely no way out – turned back and fled by sea to the north. In the end they sailed into the river Rhodan. Which river is that? The correct pronunciation of “rh” is “hr” in Ancient Greek. Therefore the river’s name was Hrodan. And after a longer search, we discover that the current name of the river is Hornád. The Argonauts, according to the myth, paddled against the flow as far as its spring – in east Slovakia. There they got the boat over the water divide and by another river they reached the Baltic. Travelling along the European coast – according to the myth, along the land of the Celts – they finally got back to Greece. It is reported that they brought amber with them – and that is to be found in the Baltic. The exact and reliable sources of information are his poems and letters to his friends. He writes, for example that he is among Scythians and Gets. He often complains about the sea freezing over every winter and people walking or riding on the frozen surface. The Black Sea is known to have been frozen solid only twice. So it cannot be Pontos. “It is similar to the bog or marsh, this lazy sea.” For sure we know from the graph, how the water level of the Carpathian Sea decreased. At the break of the era the sea was almost dried up. The sea in Constanca is neither dried up nor “lazy” nor muddy. Ovid writes, that he lives in such a place where the estuary of the Hister – that is the Danube – is located. 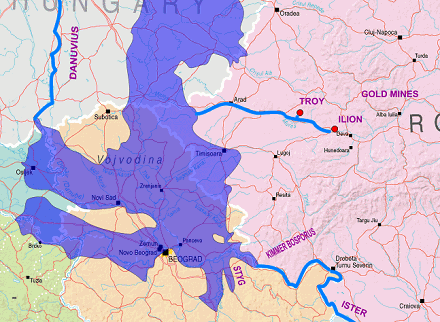 The Danube does not flow into the sea in Constanca. Ovid writes that the sea is sweet – freshwater. He describes his journey to Pont as crossing the “Haimos covered with clouds”. Haimos is the Bulgarian mountain range of Stara planina. But on the way to Constanca these mountains are small hills. On the way to the midlands, however, there are mountains over 2000 meters. And so on and so on. Herodotus writes that in the Scythian land it freezes for 8 months of the year and the sea freezes, as well as the whole Kimmer Bosporus. Kimmer Bosporus is the estuary of the Danube. ”From the Kimmers town it is 2500 steps across the straits. This width thus divides Europe from Asia and was measured by walking on the frozen straits” (Plinius).Yes, the left side of the Danube was considered to be Asia. Let us recollect Darius, who controlled Asia and that’s why he set out for a war against the Scythians, to control it all. If Ovid writes that he is “washed ashore on the bank of the Styg”, the search is simple. Even on today’s maps there is a valley, through which flows the last tributary of the Danube before Kimmer Bosporus, and this valley is named Stig. Here the “Black Sea” or also Hades, the underworld, was located. 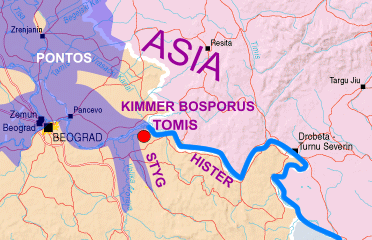 So it appears that the town of Tomis, where Ovid spent the rest of his life, is located on the other bank, opposite the town of Stara Palanka. There are ruins of the Serbian castle “Ram” and next to it there are the remains of Roman fortifications. Probably this is the place where the sculpture from Constanca belongs. Finding Troy has been the historian’s greatest challenge. What the German businessman Schliemann excavated is presented in textbooks as Troy. But it cannot be Troy for several reasons. The cause of the Trojan War was allegedly the kidnapping of a few women. It is hard to believe that in the times, where kidnapping of women was a common thing, men from all over Greece would go on such a bloody adventure for this reason. The real reason undoubtedly was the fact that Jason found out that the area surrounding Troy is very rich in gold and the Greeks set out to seize this gold. What are the golden fields like in Asia Minor? There are none. According to Homer, Troy has two names: Troy and Ilion. So either it was one town with two concurrently used names – which does not make much sense – or there were two different towns close to each other. Now, let us try to use modern technology instead of ancient historians. Let us use detailed navigation software for searching for places on the map and let us assign it the task of finding on the world map two towns similar to the names Troy and Ilion and moreover close to each other. If we enter only the first three letters – “Tro” and “Ili” – geographical names are changed particularly by endings, we will get a surprise result. In central Romania, in the river basin of the river Mures, which used to flow into the Carpathian Sea, two towns named Ilia and Troas lie at a distance of 40 km from each other. The closest gold field is again 40 km from the town of Ilia. It looks as if we have hit the bull’s eye. During the war itself, disputes among the Greek leaders, most commonly between Ulysses and Achilles, used to appear more and more frequently. After the conquest of both towns the conflicts grew sharper and led to the total disintegration of the united army and probably individual groups were prowling the area. Ulysses, as the most greedy of them, changed his mind on his way back and returned to pillage further on the shore of Pont. This turned out to be his fatal mistake. Step by step he lost his boats and even his loot. A similar fate was met by others, for example, by Achilles and Agamemnon, the return of the Greeks from the war was inglorious. We all remember from school the nonsense of how Ulysses´s return used to be explained. The hero sails to Turkey, then to the Ukraine, to Sicily, to North Africa, to Byzantium, then to Italy; the more venturesome authors sent him even to the Azores. Nobody would sail from Turkey to Greece in this way. However, if we consider Troy being in western Romania and the return by boat having to be made across the Carpathian Sea and then through the Danube to the Black Sea, Ulysses´s return makes sense. Let us have a look what it probably looked like. The guide is the river, which can assure us that all the stories must have happened on the river or in its vicinity. Strabon and others explain that when Homer speaks about a river, he means the sea, with its ebb and flow. But he did indeed mean the river. The witch Circe described to Ulysses a course of sailing down the Danube, because it had not been known to the Greeks then. The Danube probably was not – for example due to Iron gates and other places – navigable for boats upstream. The question is how the expedition arrived from Greece to Troy, but Homer does not describe this. The Odyssey supports the theory that navigability was not so great downstream either. First the Sirens – these might have a connection with the river Sirinia, the side tributary of the Danube. Rock reefs Plankts – a 40-km stretch of the Danube, that is lined with rocks 500-m high. The horrible, cave-dwelling Scylla – in the narrow pass named Kazan, there is a rock, called Sukar, where there is a gigantic cave above today’s water level. Nearby, Charybdis gulps in and sprays water. In the period about which we are speaking, the river in this place was well over 50 meters deep, with a very strong current, so huge eddies were formed – proof of this can be seen in the huge holes in the rocks, created by water erosion. Thrinakia island – the river Černá (Black), the side tributary of the Danube, in Greek the translation may be – Thrinakia. The strong wind broke the mast – the mountains must have given way to an open area, where the wind could blow this strongly – this happens at Turnu Severin. Ulysses’s boat foundered at Charybdis – the second Charybdis is today’s Iron Gate where there are still gigantic eddies. First, we will briefly present the original story as described, for instance, by Homer. Next a broadly accepted scientific explanation will follow – given either by a presenter or by scientists. Only then can we begin our story, our version of events. Thus, there will be a constant conflict of views – and the viewer will always get all the necessary information so that he could appreciate our approach. With the help of a presenter, we will use real evidence in actual locations to visualize our story. The presenter will paddle a boat down the Danube, he will sit on the rock as Ovid did, trudge up the hill to the city of Troy, he will try to pull the boat over the water divide as the Argonauts once did in East Slovakia. He will drive a 4 x 4, with a rubber dinghy on the roof and the whole event will be seen as an expedition to the European past. Among other things, this will allow us to overcome the absence of visual material for some parts of the story. Sometimes it will add a humorous element, it will allow non-formal contact with local inhabitants, etc. But it will always serve to enhance the underlying, serious commentary of historical, archaeological, linguistic, hydrologic and geographic facts and hypotheses, as well as absurdities that do exist. hmmm, interesting, never heard this version before…. I don’t wanna get into too much discussion, since I didn’t read the book. However, how does Sedlacek explain the existence of the Fruska Gora range in northern Serbia. It is likely that this range formerly belonged to the Balkan highlands. The Drina and Danube excavated their valleys in this highland. What’s left of the sea is then only half the size. Another thing that strikes me is the fact that the sea disappeared. The area is not in a geological active area, so I see no reason for that. It’s a great story though, and I have to admit that the location of Troy is still a bit vague. Great story though for a tv-story. Or maybe a documentary! As a filmmaker I don’t have much to say to the first part of the last comment. However, the Pannon Sea (Lake Pannon) is a geological fact (consult Google). The question is when it disappeared. The finest definition I have found was that it dried up “within the last 8 thousand years”. The location of Troy is one of the most debated issues when talking about Greek civilization. Judging from the accounts of Homer, Troy may be not that far from Greece. I would still believe on the earlier claim that Troy lies somewhere Asia Minor. So to speak in modern times, Troy is in Turkey. I may be wrong, but I think Homer was right. Homer doesn’t say anything about Turkey, he just describes some events and places. The question is whether he had reliable information. The author of this theory took Homer’s data for exact – that’s why he places Troy to Romania. At least I understand him this way. se prehistorical Dacia by Densusianu, there are a lot of similarities and a very alike geography. if you go to google earth and look just north of timisoara [20km] you will find a huge [1800ha] city tentively dated to middle-late bronze showing extensive signs of fire. the team from university west timisaora don’t know what it is. captivating presentation, i think your film will be a hit, i hope u get enough money to allow u to get good computer graphics. Accurate enough to get my attention. Some people though have no taste. This is an actual map to represent; Pontos which was called Patmos, Styg which was called Styx, and was in conjunction with the land set aside by God. Good information. Just want to add that the area was called Illyria…all of it from the adriatic to the black sea. It was the Romans that divided Illyria into provinces: Thrace, Macedonia, Panonia, Illyria proper, Dacia etc. So, when ascribing possible events in this area, one should consider this nomenclature.